It’s a wonderful time to be an Oregon Ducks fan. 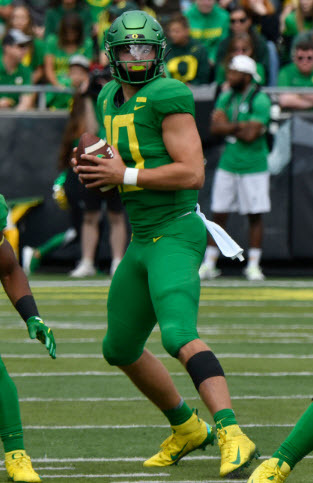 Justin Herbert and nine other starters are set to return on offense, so 2019 could be a special season. But what will it take for the Ducks’ talented trigger-man to take the Ducks to the next level? 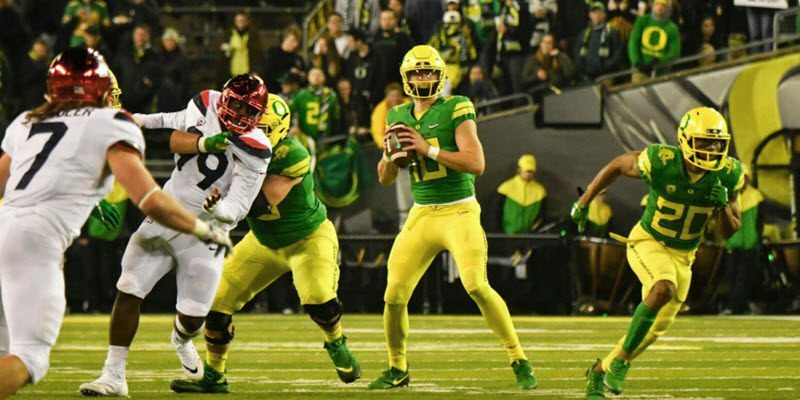 Let’s explore the qualities and attributes that make a great quarterback, and see if Oregon’s own QB can use them to lead the Ducks to the promised land. Height – At 6’6″ Herbert has it in spades, making it easy to see over and around defenses. 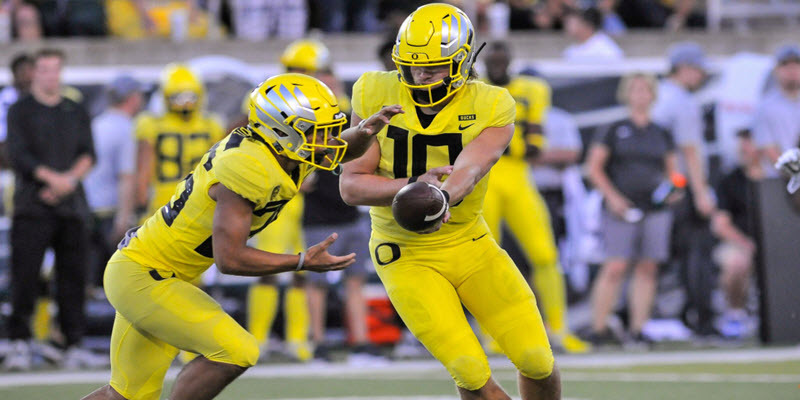 Justin Herbert’s return makes the Ducks title-contenders in 2019. Hands – A QB’s hands must have the size to spin the ball effectively, deft touch to feel mesh points and wet or cold balls, and be strong yet supple enough to interact with center snaps and running back touches. Arm – Having a gun to torch any defense and get the ball into tight spots is crucial. A soft touch to float it over linebackers and between defensive backs is also vital. Accuracy is always paramount. Feet – Quick feet are good; fast ones are even better, as they are the platform to perform. Durability and Body Strength – Getting roughed up is just part of the deal, so a buff physique is essential. Heart/Lung – A QB has to have good cardio. He cannot afford to get gassed or be short of breath. Brain – Intelligence is paramount to learn, read, react and process information instantly. Smarts are needed; a QB that is a dim bulb is rarely successful. The fact that the Ducks’ own QB is an Academic All-American speaks volumes! Eyes – 20/15 or 20/20 vision is best, as seeing the field with no color-blindness is a great skill. Student - A good QB needs to live in the film room, constantly learning tendencies and schemes to break down defenses. Being a constant learner should be his M.O. Voice – The best QBs have great modulation — clear and discernible for effective communication to mates on the field during plays and off the field as a leader. Confidence - A QB must be confident in himself and his teammates. Exuding a presence that is inspiring bodes well. Knowing when to praise and when to scold for motivation cements his leadership value. Coachability – A QB must be learning and evolving constantly, remembering defensive tendencies in order to exploit them. Communication – Getting and receiving clear instructions from coaches then transferring this to teammates is essential. Courage and Bravery - Getting hit often, yet still making the tough plays and calls is a requirement. Execution – This speaks for itself. Leadership – When doubt and confusion ensue, he needs to be a beacon of stability, inspiring and making those around him better. Trust – A QB needs to trust his coaches, players and scheme to execute game plans. Craftiness - The best QBs are street smart. They disguise plays, audible in or out of plays on the fly and look off receivers to confuse defenses. A great QB knows his keys, and being adaptable puts defenses on their heels. 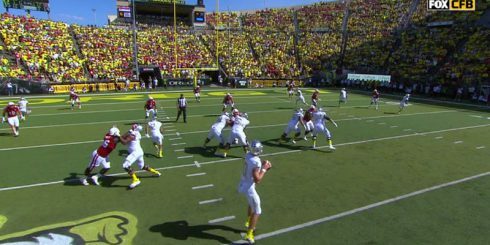 Justin Herbert hands off to Travis Dye. Selflessness - The end result matters more than his stats. He is one who also praises teammates for good performance on the field and during practice time. Instincts – The traits of pocket presence, feeling pressure, knowing when to dump it, take off or hit the hot receiver on a fly are innate. Gratitude - The ability to realize how much of a blessing it is to be “the man” is a true gift, especially with all the adulation and kudos that go with this high-profile gig. Oregon’s current QB is truly a humble guy, too — an enduring attribute. Adaptability – Life is full of unknowns, especially on the field, so being open to change is necessary and cannot be over-looked. A Defense that gets him the ball often, with stops, turnovers and excellent field position is imperative. A Scout team that exploits weaknesses in practice to maximize his team’s efficiency in live-game action is a major benefit to any QB. A Kicking game that capitalizes on scoring opportunities with PAT’s and field goals helps put points on the board. It also plays a major role in providing maximum field position, which makes a QB’s job much easier. 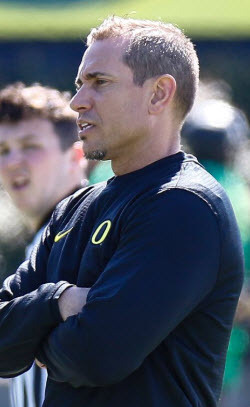 Coach Marcus Arroyo is the great unknown for Ducks’ QBs. Offensive linemen must be solid pass protectors, keeping the QB upright long enough for plays to develop. They also need the run blocking prowess to set up play action passes, which often lead to huge gains and even touchdowns, ultimately creating the balance every team strives for. The Running backs that accompany the QB require the ability to pick up blitzes, run accurate routes out of the backfield and find holes to punish run defenses. These traits are the key to taking the load off of the QB’s shoulders. Receivers are tasked with running precise routes and knowing how to get open by finding seams and stretching defenses. And oh by the way, they need to have strong hands and good concentration to actually catch the ball. A Training staff, medical support team, and strength and conditioning program with key support people help to keep the QB functioning at full or optimal health. A Mentor is critical for the development of any young QB. Good mentors mask weaknesses and maximize strengths. Does Oregon have one that fits the description? The jury is still out, but 2019 will be the tell! For the Ducks in particular, top-notch coaching and maintaining our QB’s health are absolutely paramount this upcoming season. Let’s face it, life is full of unknowns, but controlling these two variables is a big key to winning. There is undoubtedly more to consider. What would you add to this list? These above traits or qualities are needed in abundance, not only for our current star quarterback, but for those that will follow in his footsteps. As for Herbert, will he stay healthy and be guided to greatness? His talent is evident, but in 2019, we will see if he is able to make use of the attributes listed and embellish the record books.